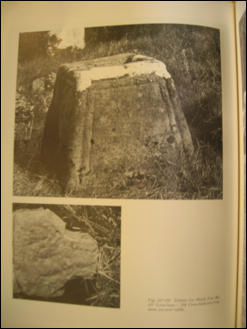 This page highlights the cross at Dulane in County Meath. It includes an Introduction to the Site and An Overview of the Cross & Site Photos. 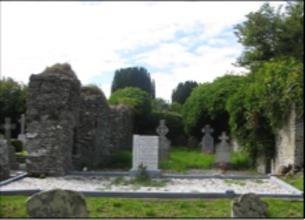 The old churchyard at Dulane was the site of an early Irish monastery established in the sixth century by Saint Cairnech. The site was known in the Annals as Tulén, or Tuilián. Saint Cairnech was almost certainly the British saint known as Carannog (Carantocus). The first life of Cairnech states that he changed his name to the Irish Cernach, presumably upon his arrival to do missionary work in Ireland. His feast day is 16 May. Dulane was his chief monastery. There is some reason to associate Cairnech with Saint Patrick. By the ninth century Cairnech was a saint of some importance. “In the later, probably ninth-century, prologue to the Senchas Már, the principal early Irish law book, it was claimed that a panel of bishops, poets, and lawyers compiled the book; the three bishops were Patrick, his successor, Benén, and Cairnech.” (Stalman & Charles-Edwards) The account could be accurate or it may be part of a manufactured history intended to connect Dulane with Armagh, the See of Patrick. The only remains on the site are a ruined church. It is described as “remarkable for its west gable, which has projecting antae and a massive cyclopean doorway. 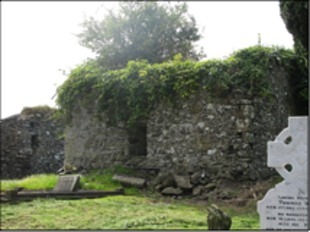 Single-cell buildings with antae may be dated between c 8 and c 12; Dulane might well be of the early period, and is recorded as being burnt in 920, on the same day as the church at Kells.” (Casey & Rowan, p. 337) In the references to Dulane below, from the Annals of the Four Masters, there is no mention of the 920 burning. This entry may appear in another of the annals. 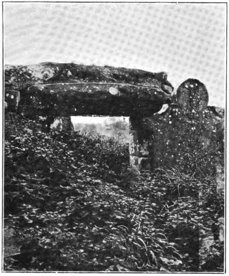 In his book Irish Ecclesiastical Architecture, Arthur C. Champneys offers the photograph (left) of the doorway of the church, seen from the inside. His book was published in 1910 so the photo is from that period or before. The cyclopean doorway is defined by the huge stone that forms the lintel. 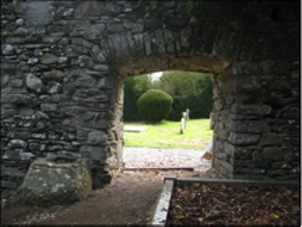 Antae refers to an extension of the side walls beyond the west wall of the church, a feature not seen in this photo. 754 CE Dubhdroma, Abbot of Dulane, died. 781 CE Faebhardaith, Abbot of Dulane, died. 870 CE Maeltuile, son of Dunan, successor of Tighernach and Cairneach, i.e., of Dulane, died, he was a bishop. 886 CE Dulane, Ardbraccan, and Donaghpatrick were plundered by the Danes. 919 CE Ciaran, Bishop of Dulane, died. 936 CE Maelcairnigh, Abbot of Dulane, died. 943 CE Maeltuile, Bishop and Abbot of Dulane, died. 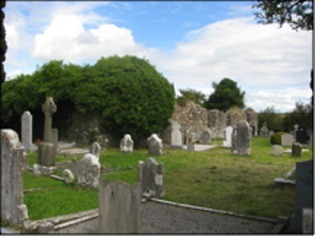 949 CE Dulane, Kells, and other monasteries were plundered by the Danes. 967 CE Maelfinnen, Bishop of Kells, Abbot of Ardbraccan and Dulane, died. 1170 CE Dulane was plundered by Dermod Mac Murchadh, King of Leinster, and the foreigners. After the Anglo-Norman invasion, the abbey of Dulane pined away, and henceforth we find it a parish church. The photos below were taken at the site in 2011. Casey, Christine and Rowan, Alistair John. North Leinster: The Counties of Longford, Louth, Meath and Westmeath, Yale University Press, 1993, 576 pages. Cogan, Anthony. The Ecclesiastical History of the Diocese of Meath, Ancient and Modern, Dublin, 1862.